Fangirl Friday - Terry Pratchett - GEEK GIRLS, INC.
Once upon a time, in a galaxy far, far away – or at least in a day and age when I was a (fairly) happy go lucky single geek girl living in Miami, a good friend gave me a book called Small Gods, and it transported me to a magical plane where the world is in fact a large disc resting on the back of four elephants who, in turn, are standing on the back of an enormous turtle (the Great A’Tuin) as it swims slowly through space. In truth, I’ve never really wanted to come back from this universe, and prolific British author Terry Pratchett has made it possible for me to visit (and revisit) this world with a satisfying frequency. 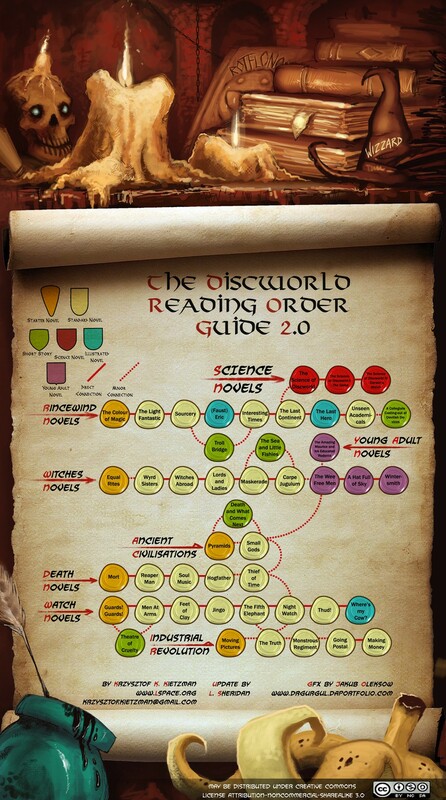 There are so many dimensions to Discworld, as evidenced in the more than forty books set in this universe. On more than one occasion, I’ve been asked what book someone should start with, and I have no idea how to answer. I jumped into the midst of it all and read many of them out of order, and loved them none the less for it - but for people who want to take a more direct or better organized path, the internet is full of suggestions and flowcharts. I would be hard pressed to pick a favorite character - perhaps Granny Weatherwax, powerful witch and head of the Lancre coven, who is (rightly) suspicious of fairy tales; or Sgt. Detritus, the troll on the Ankh-Morpork City Watch, who appears to be an idiot until he spent too much time in the Pork Futures Warehouse, which led to the discovery that trolls are quite brilliant when their brains are cold. Quite possibly the best character, in my opinion, is the Librarian - a sentient orangutan who rules the stacks at the Unseen University with an iron fist (holding a banana, of course). Alas, Terry Pratchett’s story will not have a happy ending. Neil Gaiman’s brilliant article in The Guardian this week painted a picture of Pratchett being driven not by jolly elfishness but by burning anger; it is this anger that has directed his fight for the right of terminally ill patients to end their lives on their terms. This fight is personal for him, as he was diagnosed in 2007 with early-onset Alzheimer’s disease, which he promptly nicknamed “The Embuggerance” and set about trying to defeat. As Gaiman noted, Pratchett will not go gently into that good night, but when he does go we all will rage against the dying of that light.